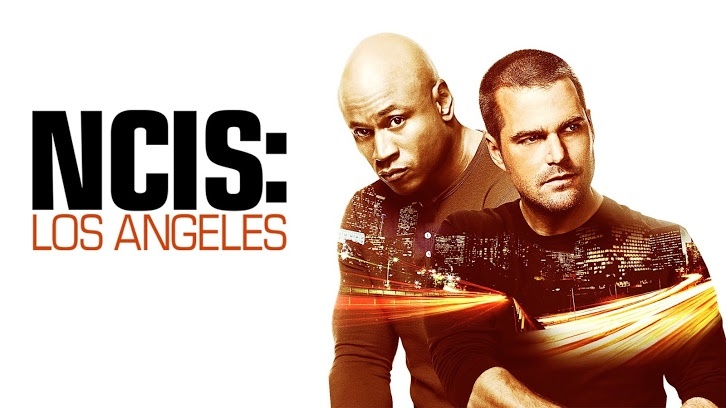 This episode of NCIS: Los Angeles begins with the shooting of two men. We quickly learn that the car the two guys were in was a marijuana dispensary SUV, and the passenger, Petty Officer Alonzo Garcia, was an off-duty Seal moonlighting as security. He's alive, but in critical condition. The driver, Jason, is still missing. Callen and Sam head to the hospital to visit Alonzo. He can't talk, but he communicates by blinking his eyes. Callen tells him they don't know where Jason is, and then Alzono has a seizure after hearing this news. Sam gets really angry after watching Alonzo's wife and daughter and seeing how upset they are. Sam usually takes cases seriously, but it seems Alonzo's situation really got to him more than usual. While Callen and Sam are at the hospital, Kensi and Deeks investigate the crime scene. After arguing and discussing the "choke point" Kensi tells Deeks she found a shell casing. I thought it was funny that she used Deeks' toothbrush (and that his mom bought it for him), but I thought he was a little over the top when he was talking about the choke point. I like it when Deeks is silly, but he was really ridiculous here. I could have done without. Callen and Sam meet with Kelly James who works for Jason and Alonzo's company. She's can't believe that this happened, and no one besides her was privy to the money runs. She doesn't know who could have done this. She also said the drives always take different routes- something Alonzo insisted on. She didn't even know their routes. This definitely made me suspicious of Jason, and Kensi seems to think Jason is tied to the shooting. They're able to get a match on the shell casing, and they head to Booker's house to investigate. Kensi finds a burner phone, and thought it was cute that she got so excited about finding it. Eric's able to locate where the phone was last used: a house owned by Edward Morrison. Sam and Callen attempt to go into the house, but shots are fired. The shots continue, but the entire team heads into the house trying to get Edward. Once they're in, they hear Edward crying that he's hurt. 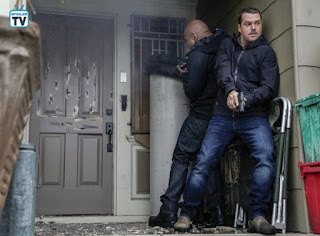 Of course he's faking and tries to shoot Callen and Sam after they break down the door. Luckily, they're on it and are able to kill him before someone else got hurt. Edward was a hoarder and had quite the gun collection. As they're going through Edward's things they realize they're missing somethings like the weapons and, oh yeah, the driver. They quickly discover Jason and Edward worked together, and they were part of a white nationalist organization. 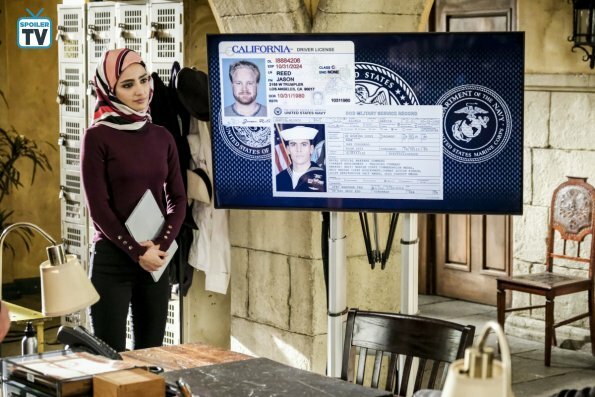 They're able to track Jason down and with a distraction from Deeks and a phone call from Fatima, they're able to arrest him. I'm glad that none of them were hurt especially since there were so many weapons on that roof. I thought that the case this week was just okay. It was pretty obvious that Jason was in on the shooting, and I can't exactly put my finger on it, but I felt like something was off. Hopefully the next episode will be more interesting. Hetty was the best part of this episode. I loved her scenes with Nell. You can tell Nell is very emotional about her mom, and she just needed to talk to someone about it. It was so sweet that Hetty arranged to fly home with Nell to talk some sense into her mom. The scene where Nell told Hetty she loved her really got to me. I've missed Hetty so much, and this somewhat calms my fears about Nell leaving. If Hetty can convince Nell's mom to have the surgery and she recovers, then Nell will stay with NCIS. I would be heartbroken if she left. I also liked Hetty's scenes with Eric. It was nice that she apologized for being gone for so long, and it was cute how nervous he was around her. 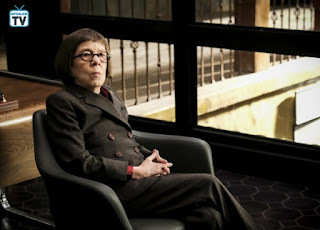 This show is better with Hetty, and I hope she stays. I also loved the ending when Hetty informs Eric they need to have a talk. It seems she knows about his new job offer. And again, I'm not so worried anymore. If Nell stays, then I don't think Eric will be going anywhere. Deeks: "That's one good thing about hoarders. They don't throw anything away." Callen: "I guess I see jello and hospital coffee in my future now." Hetty: "I'm looking forward to a long chat with you." Eric: "Oh, yeah, about what?" Hetty: "Oh, life. Love. Your new job offer." What did you think about "Choke Point?" Are you glad that Hetty's back? Did you enjoy this week's case? I've love to hear your thoughts about this episode!